Glass and bronze box with miniature 19th. Miniature with a portrait of a woman with a hat, painted in gouache on ivory foil located in the upper base. Interior of the upper base with mirror, talcum box used for make-up. 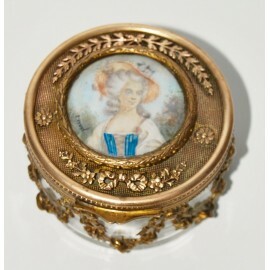 Antique glass and bronze box with miniature 19th century. Miniature with a portrait of a woman with a hat, painted in gouache on ivory foil located in the upper base. Interior of the upper base with mirror, talcum box used for make-up.